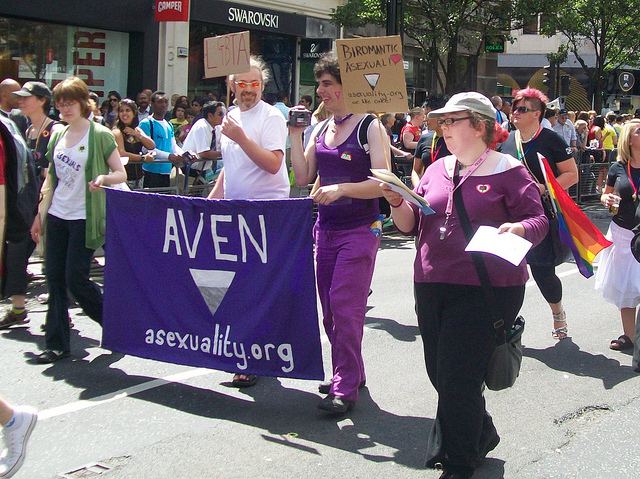 Asexual activists and their supporters marched in Pride London in 2010. Photo: Peter O’Connor | FlickrCC. Most of the advice that get thrown at asexual people runs the gamut from well-meaning but oblivious to contemptuous. Most of it is well-meaning. People are just confused by the idea because of our cultural ignorance. Modern positivity has been teaching us that everyone deserves love for so long that we don’t understand that love or romance looks different to some people. Let them talk about how they feel. They might be relieved that they found a word that fits their identity. They might be terrified that they’re different. They might be very casual about it. They might be all of these things. Believe them and make sure they know you believe them. A lot of people in their life will be trying to explain their experiences to them. Make sure you’re not one of those people. Assure your friend that they are the expert on their own life and feelings, even if those feelings don’t match what you would feel. Don’t out them. Just like any other sexuality, it’s personal information. Whether or not they’ve asked you to keep it a secret, just assume that they will share their sexuality with who they want to. Google asexuality. Check out AVEN for a good stash of information. Look up ace blogs, subreddits, and first-hand accounts. Make yourself an educated shoulder for them to lean on so they don’t feel like they have to teach you how to be a good friend to them. But don’t forget Point 2. Ask them if they’d like help finding an ace community. There’s nothing stopping ace and allosexual people from being friends. Just like there’s no reason for men and women not to be friends. However, supportive communities are vital for people looking for affirmation of their identity. Don’t feel excluded if you’re not welcome at your friend’s support meetings. Having stable, accepting, supportive friends makes any effort easier. Become that supportive person for your asexual friend.